I am new to blogging, actually this is my first attempt and I write with trepidation. So, thank you, Alex, for the encouragement and wriggle room to write with imperfection. Like yours, my academic and clinical background is in both geriatrics and palliative care. Prior to my work as a nurse practitioner in an inpatient in hospice and palliative care unit, I worked for eight years as a hospice case manager in the community. I work integrally with the outpatient hospice community and I am worried. 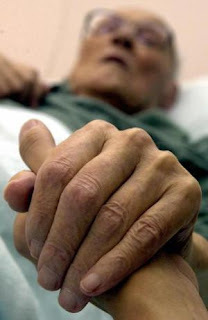 I am worried about the care of the elderly in hospice. I am worried because I know so much more than I did as a hospice RN. I know more about the pathophysiology of end stage diseases, how tricky it is to balance appropriate medication management of elders with multiple co-morbidities, what medications to use and what to avoid in the elderly. I look back on all my years as an RN advising, recommending, and instructing home care patients about medications I didn’t know enough about. I wonder how often I did more harm than good. Let me exaggerate (a bit) and say that I worked in the “morphine and lorazepam” fix most everything era; give everyone the same compounded pill/suppository for nausea and vomiting; NSAIDS for bony pain. I didn’t know what I didn’t know. I didn’t inquire about renal function, history of gastritis or GI bleed, or targeting receptors for nausea treatment. Now I know that lorazepam is more likely to cause delirium in the elderly than benefit from anxiety. Now I know that giving morphine to my patients with renal failure could result in distressful symptoms from toxic metabolites. There was no physician or nurse practitioner (at that time) available to teach and oversee medication management. I was caring and ‘well intended.’ But that’s not enough. I recently admitted a patient to our inpatient hospice unit who was served at home by a community hospice agency. (To protect patient confidentiality, details of the story have been altered, but the essential story remains the same.) She was in her 80’s, diagnosed a year prior with progressive supranuclear palsy (PSP) and dementia. Her daughter was afraid she would choke to death at home as she could no longer swallow. She felt safer having her in an inpatient setting. Upon admission she appeared to be in a deep sleep, non-responsive, stiff. Her daughter was very pleased with how caring the hospice staff was and with her mother’s relaxed state. I, on the other hand, worried. At home, she was receiving 5mg of po morphine (20mg/ml) along with 1 mg po haldol (2mg/ml) every 4 hours around the clock. “The nurse said I could give him up to 20mg every 4 hours”, the daughter remarked. “Why the haldol? ", I asked. “The nurse told me it would be smoother for her”, she replied. The patient was never agitated, confused, or hallucinating. I wondered if the hospice staff thought about how the decrease in dopamine levels would affect this elderly woman with PSP. I wondered if the haldol was part of a ‘comfort care packet’ some hospices give to all patients/families to have on hand. I wondered if the medications and their dose ranges were generically signed off by a physician. I stopped the haldol and decreased her morphine dose. The next morning she was able to sit up, open her eyes, move her limbs, recognize others, weakly communicate. Was her deep sleep and stiffness related to her exhaustion from the move? Was her one day of semi-alertness just an energy ‘boost’ before her death? We’ll never know. But I wondered and I worried about medical and nursing care of this particular elderly woman with her particular end stage disease. Hospice agencies compassionately care for newborns through centenarians. Because the vast majority of patients served are elderly with multiple co-morbidities, I wonder, as palliative care providers, if our responsibility to understand geriatrics isn’t as important as understanding palliative care. Patrice---your post will warm the heart of all Geriatricians! I think the case you describe is yet another example of the dangers of algorithmic care in older persons, and how important it is to individualize care. General guidelines or algorithms (such as the "comfort care packet") can be very useful. But if clinicians don't apply clinical judgement to their use, in the context of the needs of each individual patient, they risk doing more harm than good. The one-size-fits-all approach to hospice medications simply does not work, particularly in the elderly. Caring is not enough, we need thinking, educated, caring providers. Great comment! I'm a geriatrician working part time as a medical director at The Denver Hospice. In addition to the anti-psychotic/sinemet (or Parkinson's) combo, I also find the donepezil/oxybutynin and the tight control of glucose to be a common hospice polypharmacy errors. Geriatricians think about things like stopping the alpha blocker when the permanent foley is placed or that depression is one of the leading causes for unintentional weight loss. I agree wholeheartedly that the geri perspective augments the PC perspective. Agree, agree, agree! I love hospice, but I have sometimes viewed the care as "the 5-drug-fits-all plan". Great post! I agree with you! As a PCNP, I want to work on this issue. What do you suggest that NPs working with hospices should do to address this "one size fits all" approach to med recommendations, and to improve hospice nursing practice, especially in nursing facilities? Nurses have long been the original inspiration and foundation of hospice care. I think that NPs are in a perfect position to assist with the overall education and management of hospice patients, particularly those trained in advance illness management. I also think we need to re-look at the one size fits all role of nurses and doctors. An MD or RN behind a name who has passion about working with people at the end of life is not enough. We must start demanding training, including certifications, in our areas of expertise. Would any one of us w/o special training practice cardiology care after only a few days training and a generic list of meds associated with common symptoms? I believe nurses and docs are eager to learn, but don't know what they don't know. I think our eagerness and passion has gotten us far, but now we need to not sell ourselves short. Let's put our money where our mouth is - EOL care/advanced illness management is an area of specialty as important and valuable as cardiology, oncology, or infectious disease. If we don't start respecting that ourselves, how can we ask it of others? Scopolamine patches are another problem. I find them behind the ear of elders who were previously alert, eating, drinking, interacting. The family wonders why they drowsey and confused. I remove the patch and slowly they improve to prior LOC. I have to say that this is my biggest hesitation when initiating hospice discussions with patients who are not very near the end of life. These include heart failure patients, patients with dementia, and COPD patients. All of these may have some level of unpredictability to their disease course, but all will eventually will die from their disease. Using medications like ativan, scopolamine (great comment), benadryl should be avoided like the plague in most of these patients as they very well may hasten death or cognitive/functional decline. Your post is featured in this month's palliative care Grand Rounds!